Hard to believe that this 4th of July marks the beginning of our third year here on Lake Greenwood. I walked around today in this unbelievable heat and tried to get some good comparison photos to see the changes. The post last year had these collage photos, I apologize for the repeat of photos, but it is easier for showing progress. The photos all look better when you click on them and enlarge them a bit. You can see the grasses on the right side of the stone steps Muhlenbergia capillaris will be a pink cloud come fall. The steps are lined with Nandina domestica 'Ruby', Chamaecyparis pisifera 'Gold Threads', and Abelia x 'Kalidescope' Behind the chairs are five Catmint, Nepeta faassenii 'Walkers Low'-- the bees love it!!! 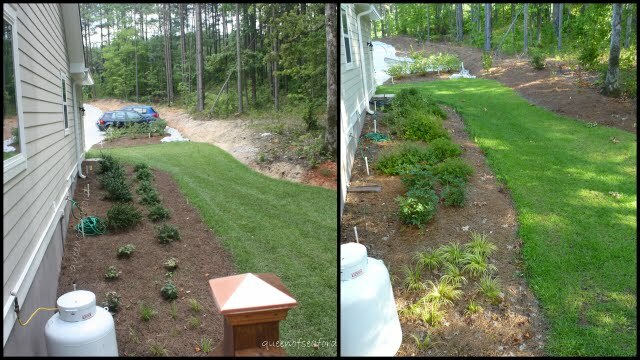 Looking from the front door you see plantings have filled in a bit and I moved to mulch instead of pine straw. Added the weeping redbud this spring. The shed has been painted but I have to paint the shutters and window boxes still. These two collages are looking at the front of the house. I forgot to prune back the Acorus this winter/ spring. Turning around you see the front gardens filled out. You can see the Gardenias have gotten larger. As we move around back the changes continue to amaze me. Specific plant material hard to identify, but the garden is filling in! This is a really dry area and many of the shrubs and trees are struggling down here. Have another hose to water this lower part. Hoping that will help them get established. From the deck steps you come to the side yard, semi shady garden. A variegated Hydrangea that was added is going strong. It just finished blooming. 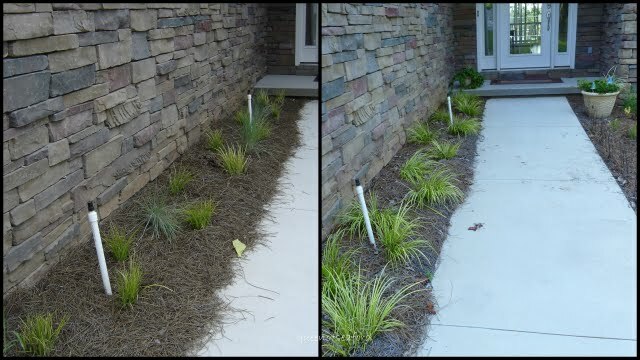 You can see these Acorus needed to be trimmed as well as the ones by the front door! ......To this easy to maintain garden. I am glad you came along with me on this yearly assessment of the growth of my gardens. Since this is the third year for many plants, we should see a leap in growth! For more photos of last year, here is the link to last year's post. Hard to believe it has been 3 years, seems not so long ago to me. The photos so a bit of difference wait a few more years.. This heat is something isn't it. Last night we had the sprinkler going, Meg was hose watering from a rain tote and I was bucket watering from another rain tote. Randy, thanks, hard to believe how fast time flies. I will keep this for the next few years, making it an annual posting. It looks beautiful, Janet. I can't believe it has been 3 years already.The heat will make it hard for the plants to grow much more this summer. Amy, thanks so much. The heat is supposed to leave for a little while, have been making sure the plants are well watered. What a great overview. I love getting to see the progress from year to year. You've accomplished so much and it's beautiful. I'd love to sit in those colorful chairs with an iced tea and chatting with you about the garden! Diana, thanks. I like to see progress, sometimes it takes having side by side pictures. I love the chairs down by the water. Great place to sit. I remember when you moved, I had just started reading your blog. Everything is coming along so nicely. You mentioned having friends/family at Ft. Lewis, be sure and look me up if you ever get out this way! I'm not far from there. Alison, I remember you first commenting. I will look you up when we ever get out there. I haven't been following you for very long, so its nice to see where you came from and what you have accomplished. I love your little seating area by the lake! Ruth, thanks for stopping by. I hope you continue to read. 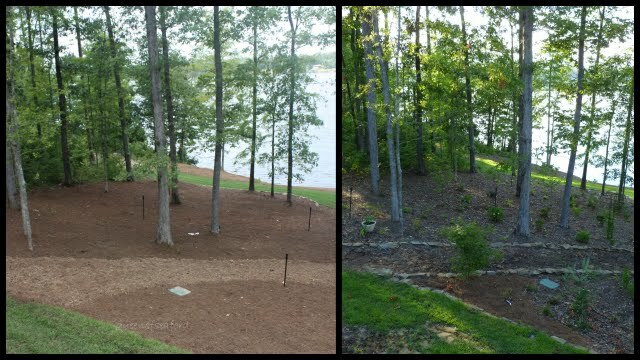 It has been a lot of fun putting all these plantings in our new home. You have a very nice property over there. Very impressive. Everything got a new touch. Congratulations! Garden Chair, thanks for stopping by and commenting. We are loving our place, a little slice of heaven. Happy home & garden anniversary! I can't believe how fast time goes by! Your adirondack chairs and stone patio look so inviting for a glass of wine by the lake. I didn't realize how much space you are gardening! Having started from an empty meadow in 2005, I know how to look at your photos and visualize how it will look when everything leaps this year. You've selected great plants and are using great design. You've got to be happy and smiling about your success! Freda, thanks! you will have to come down sometime. Sitting in those chairs by the water is just wonderful. I just LOVE it all, Janet. 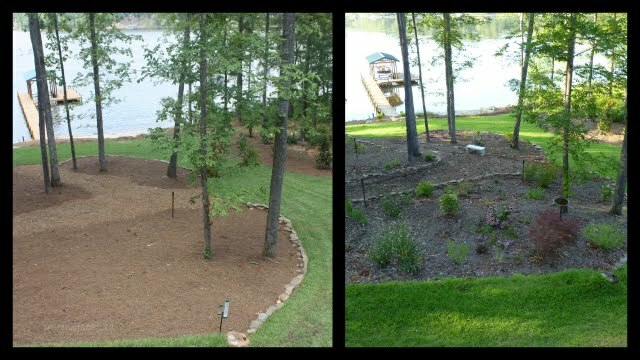 You have created a beautiful home and garden;-) It is wonderful how your photos show the progression. It's kind of like a child, they grow up right in front of us and we really can only see the changes most clearly when we look back at how they were just a few years ago! I was looking at my son at my daughter's h.s. graduation in 2007...and couldn't believe how little he looked compared to now. I 'knew' he was changing, but seeing the photo REALLY put it into perspective. Happy Gardening! Jan, thanks!! I have had a great time picking and choosing the plants. You are right, a photo really shows the changes!! I am totally impressed! You hard work (VERY hard work) is definitely paying dividends. It is so interesting to see the changes you have made. Carolyn, thanks. I work as a labor of love...I really enjoy this. 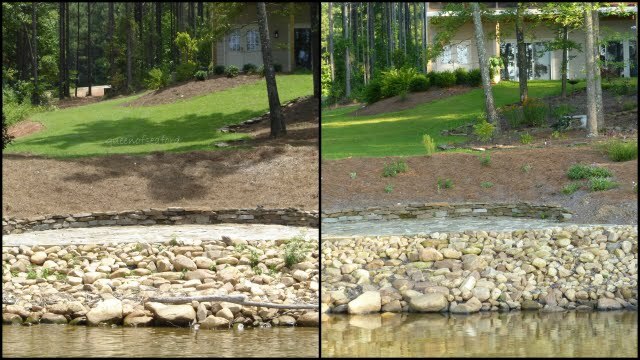 Our next thing is to get the rocks and then mulch where we had some wash out earlier in the spring. I like the collage displays. You can really see the growth. It's all looking super good. The miscanthus and artemsia must be really slowing down run off now. I really love their growth. Tina, thanks, I like the collage... it does help show the growth nicely. Yes, the miscanthus and artemesia help with the run off. Has it been three years? My how time flies. LOL! Those pictures tells it all Janet.What a difference three years have made. I adore our flagstone patio and colorful chairs down by the water. What a great spot to hang out at. Just beautiful. Lona, it is the start of year three. Time does fly! thanks so much, we enjoy the patio a lot. What a difference a year makes! Wonderful progress! Sweetbay, thanks! Each year shows a lot of change. Janet what a gorgeous spot you have...I love the views especially near the water and the front....I like the way you showed how the gardens have grown in...wonderful post! Donna @GEV, we love it here. A lot! Still pinching ourselves -- feels like living on vacation. Janet,your home is lovely and the garden of course is spectacular! I love the sitting area near the water. Do you fish? Angela, thanks for stopping by, we love it here! I don't fish, but my husband has been. We are in the catch and release program. Looks great, Janet. 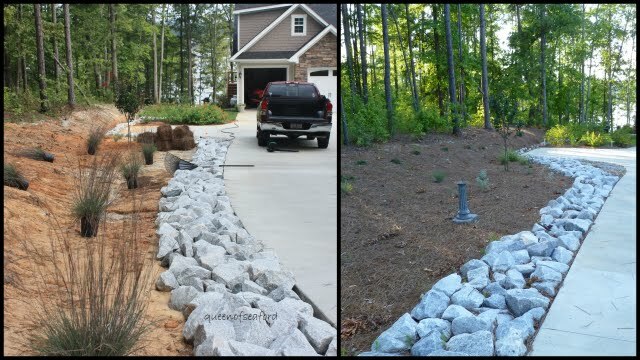 Your plantings are all growing in and the hardscape makes a nice design. You have a beautiful home and landscape. Love the water view. 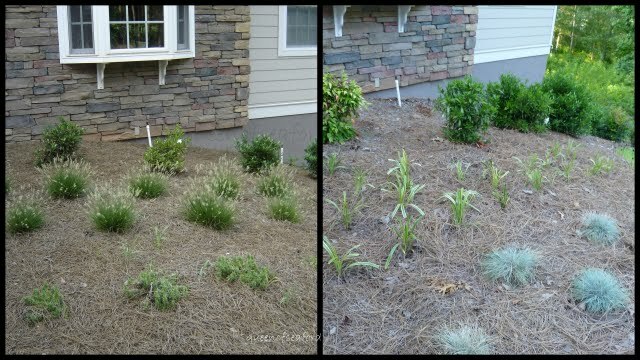 Donna @GWGT, it is interesting to see the different growth of the same plant in different spots in the garden. We love it here, so very much! I really enjoyed your pictures showing the progress. Your hard work and knowledge of plants shows in the layout. What a wonderful site for a garden. I love the gentle slope. Can't wait to see your garden next year. Gene, thanks!! It is a great place to garden....except for the deer and voles and beaver and other critters. Gentle slope? hahahaa.... our house to the lake is a difference of 25- 30 feet. Feel like I have mountain goat legs. It looks great! You've done so much work! Beautiful! Beautiful! Tammy, thanks! It is really taking shape this year. It's definitely taking on a more established look Janet. You've sure done a LOT of work but it's SO worth it. LOVE your colorful chairs down by the lake ~ that was an awesome addition! Kathleen, it is getting filled in isn't it? We were thrilled to add the chairs this spring. Love sitting by the water ---especially when taking a break from working in the garden. What fun to create and watch the growth from a clean slate! It is amazing how it all changes from year to year. I just love that we can document our gardens thorough Blogs. Such a fun way to see it grow and to share with others. I love those colorful chairs around water sources! I see them all around our lake and they seem to bring a smile to me for some reason. I reckon because I like color so darn much. Looking good Janet! Skeeter, it has been great. Yes, the changes are really starting to be significant. I like using the blog to document my gardens a lot. You will have to come up here when the weather cools off. I just realized that we're on the same time table. This is my third summer in our garden as well. Love the photos from year to year of all the changes. The back slope is coming along beautifully and I think you're right, this year you'll really see the 'leap' in growth. Marguerite, it is amazing to think how much you and I have done over the last few years...you will see the 'leap' this year too. Good for you for planting such a great garden! So many people don't make the effort. And isn't it fun to track the growth of your garden, too? It's looking great. Lisa, thanks! I have been trying to keep to non-fussy and/ or native plants. I am planning for the future. You are close enough you can come see it in person. Hi Janet, It is insanely hot here as well. One of the great things about keeping a blog is that you have a record of changes and improvements. You must be proud to see the progress in the span of a few short years. What a ton of work you've done! The shed is looking great in its new colors and I love the different colored chairs down by the water. Jennifer, I can't believe how hot is has been all over North America. I am very proud to see the changes over the past couple years. I could really show a difference and show the construction phase as well. We are happy with the shed, love the color. Beautiful place, fantastic views. I am greeting. Zielona, thanks!! Welcome and please come back. I somehow missed this post, but I'm so glad I found it, Janet. 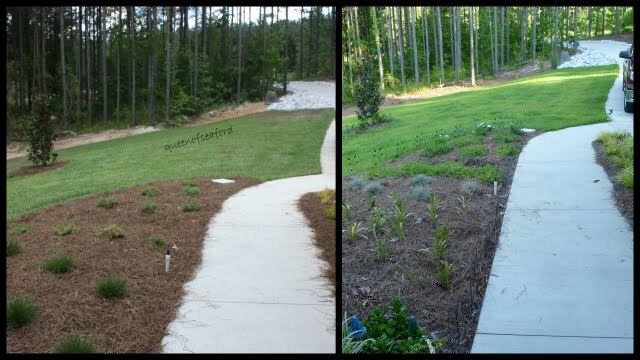 I love before and after photos, and the transformation of your garden is remarkable. 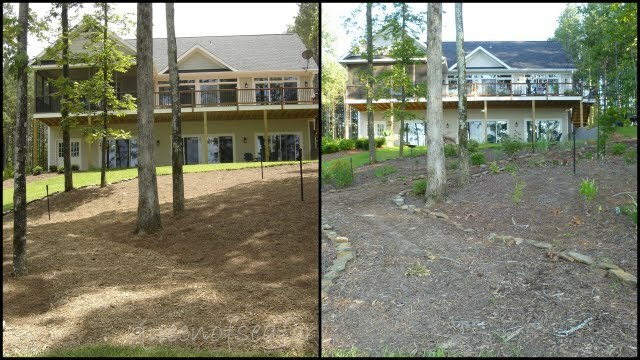 I keep thinking about all the mulch you must have spread--I'm not going to complain anymore about the small load of mulch I finally finished spreading around my garden:) I just saw a 'Ruby Falls' redbud in a garden on our Garden Walk two weeks ago and loved it; it's going to be a beautiful addition to your garden. Stay tuned on the Ruby Falls....hoping it will be stunning. GBBD -How Can It Be June Already?